The annular solar eclipse of April 28-29, 2014 will be visible as a partial solar eclipse from parts of Australia and southern Indonesia, weather permitting, as shown in this illustration. A cool new map produced by an amateur astronomer lets interested skywatchers see what next week's solar eclipse will look like from any part of the world. Xavier Jubier created this solar eclipse Google map that lets users zoom in and out of different parts of the globe to see what the eclipse will look like from anywhere. You can click on different parts of the world to actually see what the sun will look like at the time of the eclipse. Unfortunately, next week's solar eclipse — set to take place on Tuesday (April 29) — won't be widely seen. 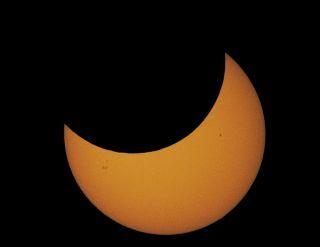 Observers in parts of Australia should be able to catch a glimpse of a partial eclipse, and the sun will turn into a "ring of fire" above an uninhabited part of Antarctica.